Shelf Road: Limestone walls are lined with endless sport routes in a beautiful desert landscape. This is considered to be one of the best sport climbing areas in the state. The warm climate makes this spot great for climbing any time of year. Nearby campgrounds make overnight trips easy and fun! Castle Rock: Amazing granite domes climb out of a shaded forest around Aspen Ridge. This is our most remote site, but definitely worth the trip. 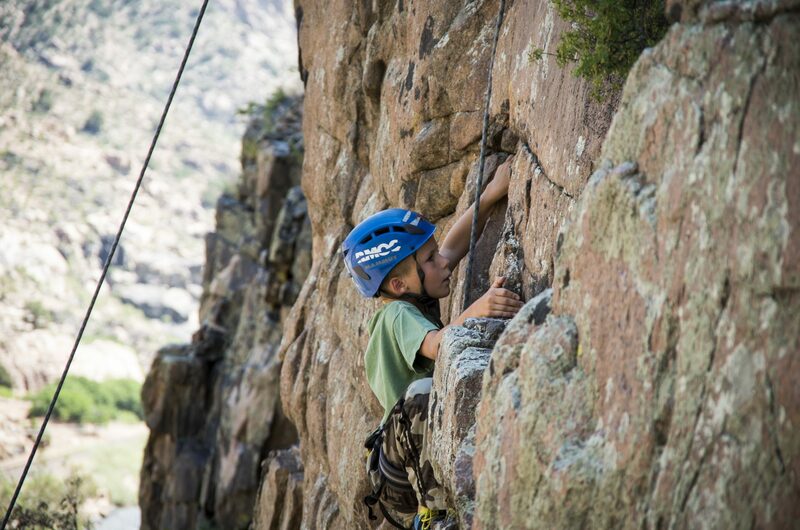 This area offers a perfect blend of beautiful scenery and classic Colorado climbing. Monitor Rock: High Mountain routes that offer some of the state’s premiere multi-pitch climbs. Incredible granite rock domes with easy approach and a variety of single and multi-pitch routes. Sitting up high in the alpine environment, you get incredible views of Colorado’s highest peaks. Climbing on these huge walls is an awesome experience. Penitente Canyon: This remote canyon in the San Luis Valley offers a variety of sport routes, from beginner to advanced. Painted frescos on the walls remind you of the religious peoples that lived here in the past, while the incredible views of the Sangre De Cristo mountains will take your breath away. The Pumpstation: A tower of granite overlooking the popular ‘Numbers’ section of the Arkansas River. As the name suggests, there are some difficult climbs here that will surely leave you “pumped”, but the South face also offers moderate climbs with exceptional views. This site also offers a unique rappelling experience. Make this a multi-sport adventure by adding a morning rafting trip! Falls Gulch: Tucked along the river in Bighorn Sheep Canyon, this crag is great for diverse groups. Half of the climbs are short and easy for beginners. The other half are longer and more difficult which gives you plenty of time on the rock. Sport routes and rappelling are also available here. Beginner, intermediate, and advanced climbs available. All equipment included. AMGA certified guide on all trips.